« My Quest to Find My Beloved Hair Spray in NYC! It’s Friday And I am Thinking About Feet! It has become painfully (ouch!) clear to me that in order to live in New York City you must become a little obsessed with your feet. Here is a pic of my poor, sad feet after a day of shopping. I know, I have a terrible Sandal tan! Yes, I am in desperate need of a pedicure. Yes, that is NYC dirt and grime stuck between my toes and YES, I do have a band-aid on my heel!! When I was out in the stores today and was stuck on line* purchasing small, inexpensive items (hubby reads my blog) I began to notice an alarming trend on many of the women who were waiting ahead of me. They all had band-aids of various shapes and sizes sticking out of their numerous types of footwear. Surely they were not all wearing new shoes or were tourists. And then I remembered, the seasons were changing. 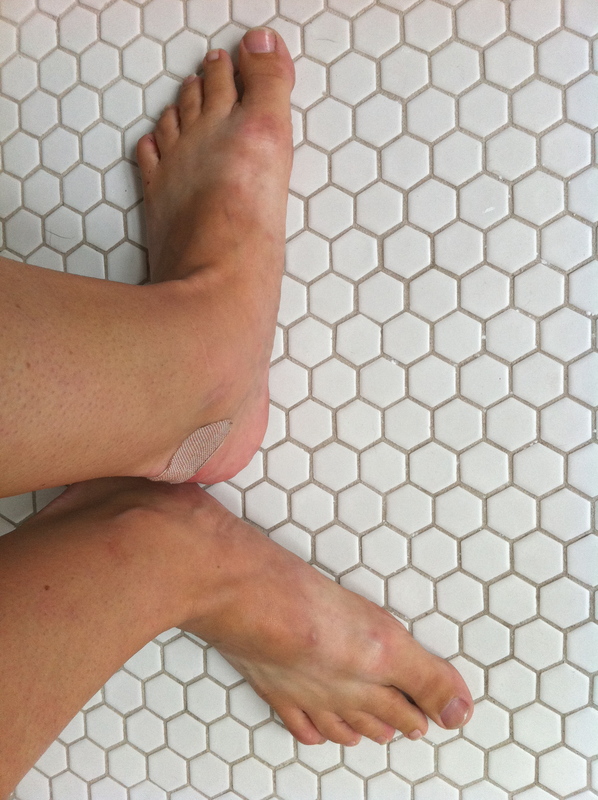 I am sure, like the purpose of my band-aid, they were breaking in old shoes as they wore them out for the first time in months. Is it any wonder that the only thing that is more prevalent than Starbuck’s on the streets of Manhattan is the Nail Salon/Club. They are everywhere. You can run in and get a pedicure in record time. For a very small cost. I should be writing this post from a nail salon, my feet deserve it. It is not smart to neglect your feet in Manhattan, they are the main mode of transportation. Unless of course you are in the economic stratosphere where you have your own personal driver. But, if you had your own driver you would miss out on the best part of NYC, all of the fun of walking and exploring each site one pace at a time. Where’s the adventure in that? *ON line is a NYC term, native to New York that actually means IN line. For example: “Excuse me, are you waiting on line to get tickets for the show?”. Weird, I know. I love Cole.. You know I love you.. But please get your feet (pedi) done before you slip them into those babies..
Did they have my size!! Whoa!!! Those are like the Sapphire version of the Ruby Slippers!!! We’re not in Kansas anymore!!!!! I am so pleased to see you’re buying more Barbara shoes. Now if only you were my size!!!! Miss you cuz! I would so wait ON-line for those… gorgeous shoes. Enjoy the pedi! proper attention to the ingredients and chemicals used in products. time to react with skin and gradually darkens dead skin cells. After all, anyone can design and print a newsletter or informational flyer, but how many businesses, organizations or even individuals print their own periodicals. Georgina Clatworthy is a dedicated full time writer who composes informative articles related to wedding favors and weddings. occur for those who are allergic to dihydroxyacetone. a golden “tan” effect. Custom coatings are regularly engineered by APS Materials, Inc.